In the Business Insider piece, Rousey was placed above sporting luminaries and powerhouses such as Cristiano Ronaldo, Serena Williams, and LeBron James. Rousey was the UFC’s brightest star and one of the most recognizable faces in sports. A chain of endorsements, advertisements, and movie roles were thrown her way and she gladly fell for the spell of fame and notoriety. In 2017, the seemingly invincible aura built around her by a multitude of successive stoppages and an undeterred hype machine sits like ruins in the sun. Having slipped into the shadows following her first professional loss to Holly Holm at UFC 193 in Nov. 2015, Rousey would return with tales of woe, depression and suicidal ideations as a result of her brutal knockout. It wasn’t necessarily the punches and kicks which Holm landed on Rousey which was so surprising, it was the manner of just how helpless and outclassed she had looked inside the cage for the first time. It was as if the sport had evolved right before Rousey entered the cage, yet, no one had informed the UFC women’s bantamweight champion. Having opened up on her dramatic downturn on talk shows and dismissed talk of retirement, Rousey would return to the promotion in Dec. 2016 against the incumbent bantamweight champion, Amanda Nunes. The Brazilian title holder was clearly set to relish the challenge and had further cause for determination to win following the UFC’s baffling promo for the bout – one which had almost exclusively focused on Rousey. Rousey, who was exposed against Holm for daring to go toe to toe with a superior striker rather than focus on her ground game, paid the price. No lessons were learned from the year before, no changes to her game plan were evident. In fact, nothing had changed except Rousey’s demeanor, which indicated that she had already accepted her fate before the 46-seconds it took to seemingly end her career as a professional fighter. Having stopped her first 12 opponents in pro-MMA by employing her solid ground game and Judo, Rousey wanted to focus exclusively on being a stand-up fighter. Tarverdyan, who has been criticized in the past for lacking anywhere close to the credentials of his peers, was blamed for enabling this belief. 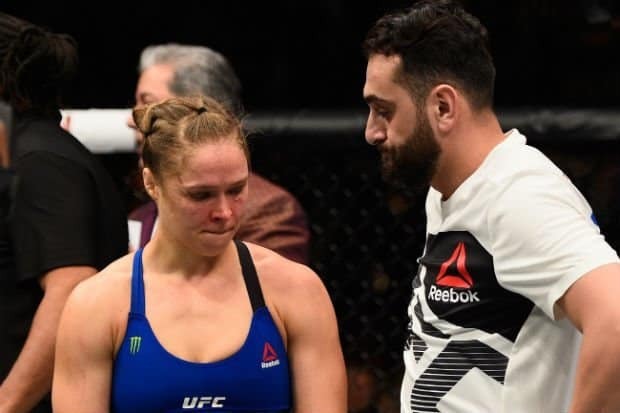 Whether or not he was a yes man is uncertain, but as her coach deserved to take flak for his failure to adequately prepare Rousey against Holm and especially against Nunes (given the manner of loss in her previous bout). While Rousey’s fall from grace began in Melbourne in November 2015, it was the manner of how she reacted to the loss in the months after which was (with 20/20 hindsight) the defining chapter of her career. Having fallen into a comfort zone from which she felt completely untouchable off the back of a money-spinning hype machine, there was no safety net or cushion to break her fall – she had never expected to need one. With the poor level of coaching at her disposal and a seemingly endless conveyor belt of “yes men”, Rousey essentially stagnated as a fighter. Following her loss to Holm and prior to the bout with Nunes, it was expected that Rousey would come back to the octagon with a game plan exclusively focused on taking Nunes’ power away from her and to the canvas – that did not happen. While many had hoped for the triumphant return of Rousey on that night, her failure to learn from her mistakes and adapt to the changes around her were fundamentally what led to her downfall. While Ronda Rousey is yet to officially announce her retirement, the “Rowdy” and seemingly unbeatable icon of the octagon will never be seen again. Has Conor McGregor Intentionally Fooled Everyone? Conor McGregor Has No Chance Against Floyd Mayweather Jr.